First and foremost, we’d like to thank our AMAZING readers, guest bloggers and partners for helping make this possible! YOU ROCK!! 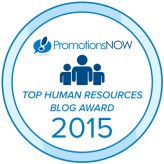 Springfield, MO – (Campus to Career) was recently named by Promotions Now as one of the Top Human Resources Blogs of 2015! Organizations were honored for their human resources insight, business innovation, and community growth. Campus to Career was selected based on a three-part evaluation of such criteria as addressing the pain points of the talent acquisition community, key contributions human resources has on business success as well as staying on top of the latest HR related news and business strategies. Nominations were submitted by readers and staff and winners were chosen to help clients and partners utilize the best human resource blogs and business advice on the web. Campus to Career stood out in a unique way among the tough competition and is now featured as a recommended Human Resources blog resource. A special thank you to Sarah Landrum, who regularly contributes fantastic articles as a featured writer and member of the Campus to Career family.